Ottobock rehab buggies such as the Kimba Neo offer good support while travelling and from the outside you can hardly see that the Kimba Neo is a rehab buggy. For children aged 1 to 10 years who need more support, the Kimba Neo is a multi-adjustable comfortable and shock-absorbing unit. You can adjust virtually all settings yourself (or with the support of your local dealer) to meet the individual needs of your child. 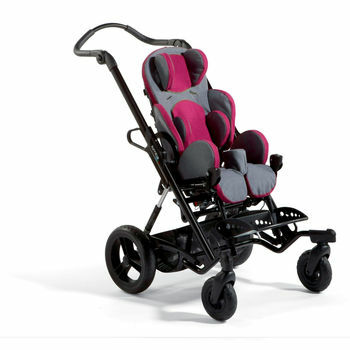 This means the Kimba Neo "adapts" not only to your child but also to the current requirements. If your child gets tired while out and about, you simply tilt the seat back to provide relief. When your child wants to see more, you tilt the seat forward a little for more active participation in the surroundings. Fast switching to the rest position; with the seat tilt mechanism, you can tip the seat to various positions. Continuously adjustable backrest angle; the backrest adapts to the needs of the child. Reclining position; The Kimba Neo rehab buggy is even suitable for sleeping. Changing the line of vision; the seat can be easily rotated in the direction of travel or the opposite direction. Plug-on tray; the tray is quick to plug on and take off. Padding, soft, cuddly and attractive, but also fulfils a therapeutic function.